MATCH REACTION: Manager McCann is a much happier man this week! Manager Grant McCann praised a disciplined, resolute team display as Peterborough United returned to winning ways in League One at Swindon today (January 21). A goal from skipper Chris Forrester in the first minute of the second half sealed a 1-0 win at Swindon and lifted Posh up two places to eighth. A win at Oldham on Tuesday (January 24) would move Posh to within a point of the play-off places. Posh manager Grant McCann urges his players on at Swindon. Photo: Joe Dent/theposh.com. It was a fine bounce back from Posh who lost their previous match 5-1 at Bury (January 14). “It was a great response from the whole team,” McCann enthused. “To be honest it was just what I expected because they’ve trained really well all week. They were quick to forget the Bury game and to get ready for this one. “If anything we were too cautious in the first half. We played a bit too safely and that was probably down to what happened at Bury. “I had to remind them what good players they are at half-time. I asked them to trust in their ability and once we took the lead I felt confident we would go on and win. McCann rang the changes today by handing on-loan central defender Dominic Ball his full debut and moving Michael Bostwick back into midfield. Lee Angol and Marcus Maddison were recalled to the starting line-up. “Dominic Ball is a very good player,” McCann added. “I wanted to play him at Bury, but he picked up a knock. He’s good on the ball, he gets people to play and he’s aggressive and a very good organiser. “You don’t win cups and titles in Scotland without being a very good player. “Michael Bostwick plays that defensive midfield role so well and every time I play him there, Forrester scores! 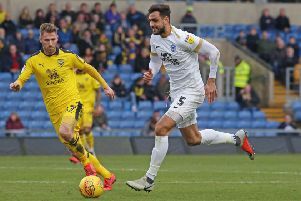 “I gave Chris a lot of criticism last week as it was the worst game I’ve seen him play in a Peterborough shirt, but he responded well today. He responded like a real captain. “Angol was good also. I’ve probably messed him about a bit by playing him and then leaving him out, but he was strong and led the line well.